ADI offers a full line of power products from leading manufacturers including Minuteman. What Can Go Wrong with Power? Outright power failure is often what comes to mind first when power problems are discussed, but a host of other, less discussed problems such as brownouts (small dips in power), spikes (large increases in voltage), and surges (sustained over voltages) can also spell disaster for a security system. Moreover, an ever-increasing demand for power combined with an aging infrastructure network means that the likelihood of these problems occurring is not going to decrease any time soon. The implications of facing power problems unprotected are wide-reaching, with electrical outages accounting for billions in annual damages to the U.S. economy. On a smaller scale, business owners, administrators, and security managers face the prospect of their patrons being exposed to dangers in the absence of surveillance systems, access control measures, and fire alarms if power to security systems is allowed to fail. This is obviously not a favorable scenario for a business of any size. Fortunately, power protection prices are at all-time lows, and each portion of the security system has a specific set of recommendations to face power problems. The most basic type of power protection is the surge protector. These products are designed to protect attached equipment from catastrophic damage caused by spikes and surges. Surge protectors are an inexpensive solution that can pay huge dividends should a spike or surge occur. Investing in expensive security devices and not protecting them from catastrophic damage is not a sensible choice. For more critical devices, an uninterruptible power supply (UPS), or battery backup system, is a necessity for complete protection. UPSs protect against all types of power problems; from sudden spikes or surges to brownouts and blackouts, along with electrical noise. Each of these anomalies can result in damage to equipment or disruption of important applications. There are three common types of UPSs: Standby, Line Interactive, and true On-line. These can be viewed as a good, better, best lineup, with each having their own relevant applications. Standby UPSs feature the simplest hardware, and are usually sufficient for small loads such as intrusion systems. Line interactive units span a wide range of power ratings, and provide increased battery life thanks to more sophisticated automatic voltage regulation hardware. Finally, true On-line units are best for larger loads where power quality is critical thanks to high-end double conversion hardware that eliminates all irregularities from incoming power. Where is Power Protection Necessary? 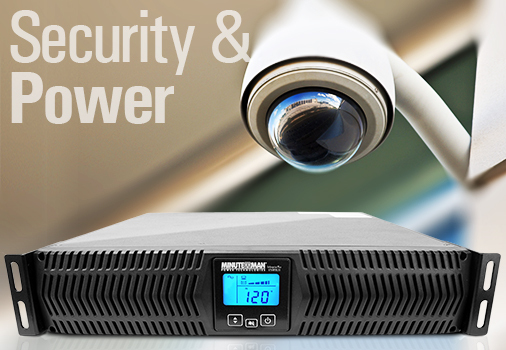 Power protection is needed on any system that is depended on to keep a facility secure. This includes cameras, video recording devices, access control systems, fire alarms, intrusion detection devices, emergency communications equipment, asset protection or loss prevention systems. All of these systems play a vital part in protecting a business or other institution and should be considered mission critical. Let’s break down each area of the system, and see what the power protection requirements are for each. Making power protection an integral part of a security system installation and disaster plan is essential, no matter the type of business or institution. Many security system dealers have even made it a point not to sell a security system without adequate power protection. This not only protects the customer from possible liability and safety issues, it also protects the dealer from having a very unhappy customer and being dragged into litigation. Security systems are designed and installed for protection – not protecting them with proper power solutions can negate any benefit of the investment in a security system. Security shouldn’t end when the power goes out, especially when it’s completely preventable and affordable. ADI offers a complete line or power products from leading manufacturers, click here to learn more. NEW “REORDER” ON THE ADI WEBSITE!